Off the beaten paths. 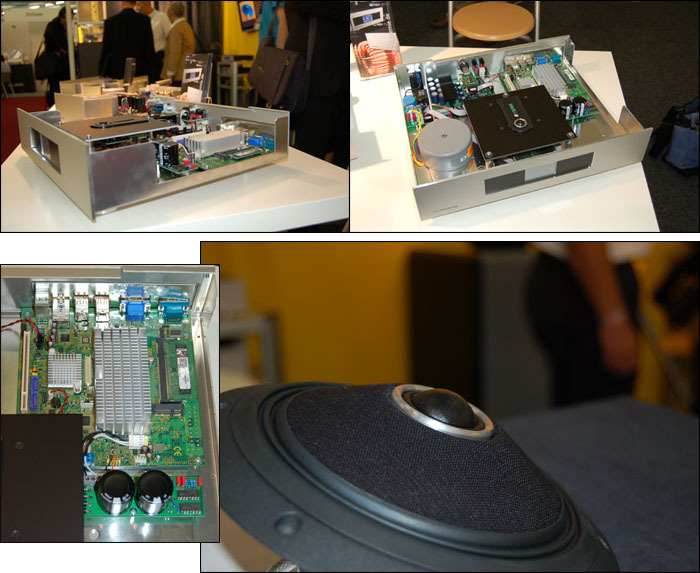 Audionec showed an unusual two-piece system. Those assuming that a combo of music server and active speakers couldn’t possibly be too costly will swallow hard when faced with their €74.000 sticker. The SDV3-S server consumes €24.000, the Answer speakers 50 large. The source component is partitioned into three sections. The lowest one contains the PSU, the upper one the PC parts and SSD hard disk. There are no mechanical bits, no fans. Cooling is entirely passive and noiseless. The central compartment contains the converter with four ladder DACs which the firm's sales manager Jörg Klein calls responsible for much of the sonic performance. Their portfolio includes two ‘lesser’ servers. The SDV3 upsamples to 192kHz instead of 384kHz and processes streaming data up to 96 rather than 192kHz. It still weighs in at €17.000. The €10K STV3 omits the DAC. 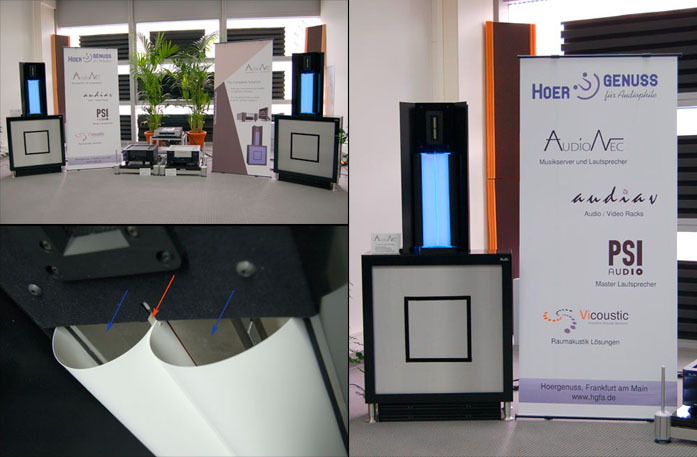 Audionec’s speaker solution doesn’t just look unusual. As an active speaker, there are built-in amps - four per side. The active crossover can be tapped digitally via AES/EBU or analog via RCA or XLR. Besides response and time domain adjustments, comprehensive room correction is possible. Below 200Hz the Answer speaker operates as a dipole. The widebander above covers 7.5 octaves from 200 to 20.000Hz but gets augmented by a ribbon above 15kHz. The apparent bass panel is really a strange dynamic driver. Its unusual diaphragm is reminiscent of Linaeum's bending wave geometry and Serge Schmidlin's more recent derivative project at Audio Consulting. The red arrow in the photo below points at the voice coil, the blue ones at the magnets. The cylindrical film diaphragm expands and contracts and radiates sound waves forward and back. Because listener eyes invariably accompany listener ears, remote-controlled LED backlighting can let the speakers radiate nearly any conceivable color into the room. Computer & Hifi revisited. 5-figure budgets aren’t always required to keep up with the digital trend. HifiAkademie’s Hubert Reith wants €650 for his Netplayer interface module. It’s an upgrade board for the firm’s own DAC and CD players. Netplayer + DAC then cost €1.940 combined. This explained the empty real estate inside the CDP/DAC. The interface upgrade was already planned when we reviewed the spinner. The Netplayer interfaces with nearly all data formats up to 32-bit/192kHz. Cooling is passive, the GUI preferably WLAN mobiles, iPods or Netbooks. The Netplayer automatically grabs album covers from Amazon’s data bank. Herr Reit showed with German firm Audio Consequence whose Michael Lenz has attacked the reflective waveguide/horn effects of coaxial driver placement by turning the matter inside out. His inverted coax is scheduled to hit the market in the 3rd quarter of 2010, pricing TBA, sales factory direct. Computer & HiFi again. While the above Netplayer required an external hard disk or PC as server, the Arcus Incantare Mediaserver is a true one-box streaming audio management package. This includes video like DVD and BluRay discs. There’s built-in 1TB storage which can be pimped out externally up to 8TB. There’s 1080p HDTV and a 7.1 HD audio output as well as a stereo pair for conservative highenders. What if one cares nothing for video? Later in the year we’ll see the Audioserver which will strip the Mediaserver of all picture playback to become a pure audio machine with CD transport and multi-room functionality. Anticipated pricing is €3.000, i.e. €2.500 less than the current Mediaserver. For simple one-push ripping and archiving, Arcus also offers the Musicstation which combines a CD drive, 160/320/500GB hard disk options and a 60wpc class D amp in a half-width chassis starting at €1.650. The Incantare range offers silver, black and—unconventional—white finish options. 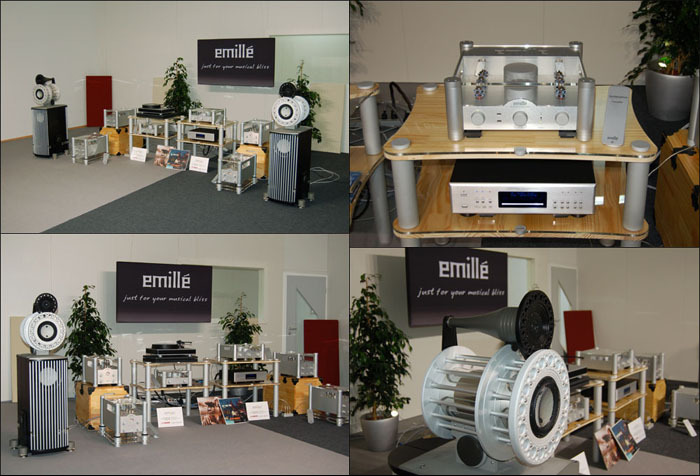 Domestic distribution was signed to Sintron Audio which explained the latter’s own brands like turntables and electronics by Thorens as well as import brand Focal. 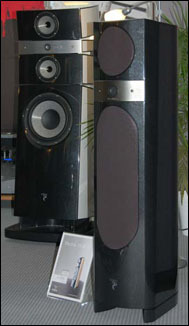 Focal's Electra range available since October 2009 has high-end ambitions but remains in the ‘within reach’ category unlike the top-range Utopia models. 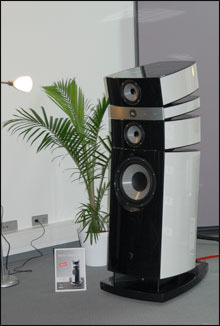 Sintron’s Herr Kempf insisted on technical trickle-down benefits well beyond the new Electra Beryllium tweeter however. The left photo shows the biggest Electra model in the front. The 1038Be tops out at €9.200/pr, runs three 18cm woofers, one 16.5cm midrange (at the very top) and the Beryllium tweeter in the middle. 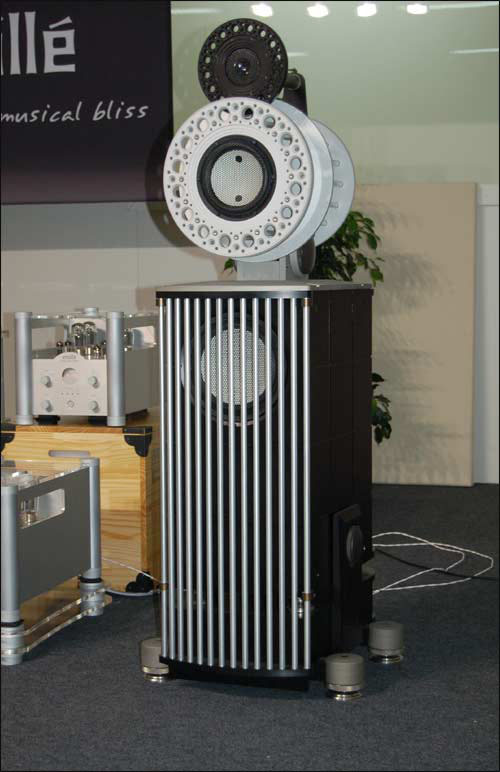 At 50kg per and a height of 1.25m, this is a mature speaker. Yet juxtaposed against the Stella Utopia EM in the background—ca 1.6 meters, 165kg fighting weight and €70.000/pr—it might seem quite demure. It’s all relative. Audiodata of Aachen showed a very different loudspeaker. The €4.450/ea. Allongé is due out in 3-4 months and a dedicated quality center channel or "problem solver for very big screens". Two Allongé units could even serve L/R duties below a screen. This model is related to the Ambiancé monitor whose frontal coax driver and one woofer per side it adopts. The firm also brought a digital room correction device, the Audiovolver Basic, small brother to the existing Audiovolver II. At €3.450, the Basic saves €1.300 over the bigger box and omits items like a network connection and the second hard disk, simplifies the power supply and can only be operated by remote, not manually. 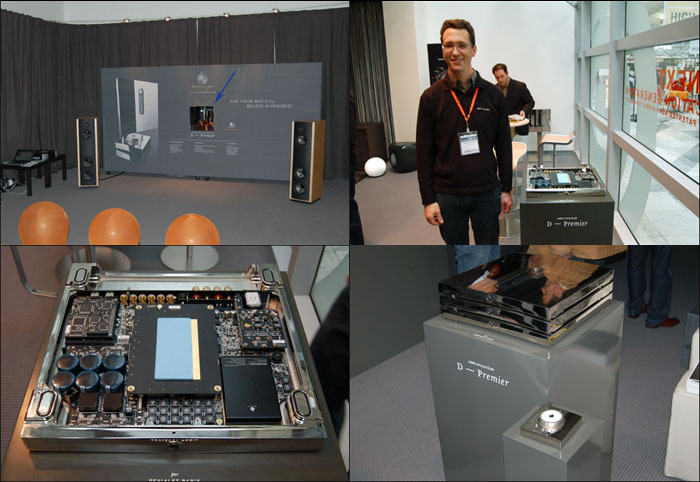 Audiodata’s Herr Bohm commented that the core processor is identical however. Merely functionality was scaled back. Even the service concept of the on-site data acquisition session and subsequent hardware calibration remains intact. French revolution? Each company must be convinced of itself to successfully hawk its babies to the consumer. A bit of positive thinking is expected. But Audio Components Herr Khavari’s boundless enthusiasm for his latest—the first product of an essentially unknown brand—was completely off the charts. Regardless, he predicts a revolution. The saboteur in question is the French brand Devialet and its D-Premier, a flat flounder of an integrated amp 32mm high and at 7kg fit for wall hanging. No lifestyle effort but authentic technological quantum leap is how Devialet’s technical director Mathias Moronvalle calls it. He dubs the secret AHD technology. It stands for analog/digital hybrid to describe the basic concept. A class A output stage delivers voltage gain to the loudspeaker while a digitally driven class D section delivers sufficient current to maintain class A bias regardless of load – quite the promise in theory. The D-Premier accepts digital inputs, even HDMI and HD signal from SACD and BluRay since a DAC is onboard. There are analog inputs as well, even MM/MC. And yes, those get converted to digital. The fascia contains a single control as power switch and there’s a very unusual remote control for the rest. Price is €12.000. To wrap up, how about some Far-Eastern exotica? For ca. €140.000, this 'small' and predominantly Korean system would trade owners. Save for the €6.000 Cary Audio 303T SACD player and Dr. Feickert’s €3.500 Woodpecker turntable, all electronics in this final exhibit came from South-Korean tube specialist Emillé Labs. Domestic importation was signed by Adrian Bankewitz of Thiel & Partner also known as Accuton. The laterally placed Rapture monoblocks [€25.980/pr] were run in bi-amp mode to deliver 110 watts to each loudspeaker terminal while the €6.990 Quintessence linestage passed the signal and shook hands with its €2.990 Allure phonostage mate for vinyl.